"Remember, they love money, so just pretend like you own a gold mine"
The time that mining for crypto-currencies like bitcoin could turn into gold is far behind us. Mining, or rather calculating new solutions for incorporating transactions into the ledger is done by high end computers or dedicated ASIC's. Mining with your own computer system, with or without making use of the computing power of the graphical interface does not always way up to the investment and/or cost of power. For the few who are interested in the crypro-currencies there is a way to participate. Joining a mining pool, where the combined computing power is large enough to earn some coins is a possibility. There the found wealth is divided proportional to your contribution to the total calculating power. And even if you want to participate, but do not have the programming skill or equipment to start with the mining process, there is the opportunity to mine on your mobile phone. A high end mobile phone like the Octal-core Samsung Galaxy S6, hold just about equal calculating power than a PC with a Quad-core Intel-I3 processor. The android app NeoNeonMiner can be used to perform the required calculations for multiple hashing algorithms. The software is optimized to be used with the ARM-Neon processor. A processor variant that can be found in most android devices. Is it fast? Well... no if you compare it to ASICs or high end computers, but steady and it beats visiting the various faucets to increase your crypto-currency wealth. 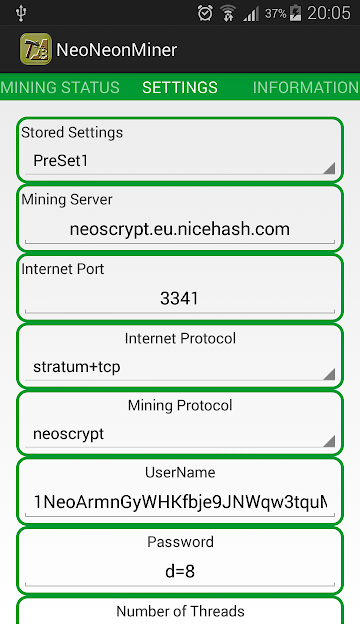 The NeoNeonMiner app is a stand-alone CPU based miner. In order to get rewarded for your contributions to the crypto-currency network the settings of the miner need to be changed to reflect your personal settings. Unchanged or invalid inputs in these fields will result in loss of your mining efforts. The settings you need depend on the mining pool you align yourself with. The default settings of the miner are the developers own credentials. If these are not updated your mining effort will be linked to the owner of these settings! Running with the default settings is appreciated, but will not be rewarded. NeoNeonMiner can store up to 7 PreSets. Each preset is a completed settings page. This feature allows quick switching between various mining pools and/or protocols, Each update on a PreSet needs to be saved using the STORE button on the bottom of this page. The URL of the mining server this PreSet will use to obtain it's work. Selection of the mining pool, usually based on profitability is an end-users choice. The port needed can be found on the getting started sections of the various mining pools. This setting is provided by the mining pool. stratum+tcp is the most common settings used. Selection of this protocol is usually done based on profitability. The neoscrypt protocol holds the most speed optimized code. The App does support various other protocols. Selecting another protocol mostly requires another Internet Port as well. This field is identifying you to the work you submit. Based on mining pool requirements the field value here could be. Roughly there are two variation here. There are anonymous pools that require you to use your Bitcoin (Altcoin) address. When a payment threshold is reached payment will made to the address listed here. These pools use the password field for other settings. There are also pool that require you to register, These pool usually operate with a 'real' username/password setup. On your personal page of these mining pools the payment details can found and/or updated. Used as password on mining pools that require registration. Can be used for settings on some anonymous mining pools. The d=8 in the screenshot stands for minimum a difficulty setting. The max number of threads is equal to the total amount of CPU's in your device. Since the app is making the phone work hard it requires a lot more power (battery) than in idle mode. Also the phone's temperature will go up. Selecting less then the max number (not possible when only one CPU is present) can reduce the power drainage and temperature, but it will also reduce the hashing speed. Please also check my getting started video on YouTube. This app provides a possibility to register. Make the app perform different, the code execution is equal to registered and not-registered. Make you/your phone part of a NeoNeonMiner network of miners. Automatically update your settings or register your setting for payments. Can I mine at a GH/S level?.. No, not with a mobile device. GS/S level is impossible with CPU based miners, and a CPU of a mobile device is not extremely powerful either. As of 19th Jan 2018 what mining protocol would you suggest to see SOME returns? - Samsung A3 - Thanks in advance. Found 26 blocks, but on my btc wallet nothing changed. Blocks found when connected to a mining site, is a means for the mining site to track your progress, they are usually not blocks found on the block-chain of the coin mined. I only hit this threshold every 3~4 months myself if I mine only with my android devices. It works very well and is a good program. Do not have a pc version? How to mining with computer ? Need update...put xevan and equihash pool..cant mining neo pool anymore in zpool.ca since they give 0.2 profit + 2% fee...is anyone know any other pool like zpool? Please comment..
How can I register your great app? I'm from Brazil, need a support im portuguese please. I'm got the APP on GooglePlay, but can't find a server to take a new configuration. If possible say some lista of server to this APP. Hello sorry about the auto corretion. 2 needed BR Support Pt. I have found 44 blocks, but on my bitcoin wallet nothing changes? What is the problem? Or what can i do? When mining on a pool, you are not "finding blocks" you are being awarded shares based on your hash rate, when compared to all the other miners, so that when the pooled hash-rates of everyone finds a block - it is shared out to everyone who contributed according to what share each person had of the total hash rate of the pool. Finally a reply that makes sense. How often are payouts on average or is it just dependent on how many people are mining and at what rate? Os blocos se acumulam ou tenho que encontralos todos de uma vez ate dar o limite de transferência para a carteira? Pois ja encontrei 100 uma vez e outtad 20 50 80 . A Wirex é uma carteira aceita para receber? Please register for me , akhiruddinftsm@gmail.com. X17, skunk, blake2s and groestl please. I like your app, but my Samsung Galaxy S7 just got way too hot. I had to take it's cover off and then it was burning me through my pocket! And if possible please add the algo Groestl and Skein. I downloaded the APP and have been mining with my INFINIX NOTE3. But I don't know how to change the settings to earn revenue. I have tried on the settings but it seem to remain on the default. Please register my as well. Hi, what a great app !! Good job, well done, and easy to use (if you don't understand how it works...you just have to Google it...). Can I be registered please ? Can we not get in a pool and try it on our on? Can I have it where it's just me mining by myself? Thanks. Will try and will let you know in case of any issue. I have 3 S6 using app 20+ h/s.. tried S7 edge.. 0 hashrate.. can't get any hashes .. but liberate gives me 30+ hash/s... Any idea to fix ???? If it's possible, please add scrypt2 algo for mining. Hi in zpool.com I was reviving ton of block but in nicehash.com it always 0/0 block ....can any one help ? Awesome job! Very nice and smooth app! However, I use it on two Samsung S8+ and also on Samsung J7 with Cryptonight. On J7 it gets 15 H/s with all 8 CPU, but on S8+ can't go over 1.5 H/s. What is the problem? Is it working good with old phones only? I have no response yet. How does the registration work? I left my e-mail address here like other people did. Is there anything else that I have to do? Thanks! Hey guys, how does that registration work? I've sent a request and haven't got an answer. Does anyone know? Great information. Let us know how to proceed. No connection with server is what mine says. Tried multiple pools and coins. No luck. Please help. NeoNeonMiner has been removed from my phone, no, not by me. It was there, hashing away yesterday and gone this morning. It's not on Google Play anymore either. What's up? No google regard at this. Try other browser. It shuts down very often while I refresh mining pool page to submission. There are still 250-300 MB RAM. Please, respond. I have blocks working for eobot but the blocks are not being recognized by the server.can I make this work out for eobot?